Robo-cuteness overload! 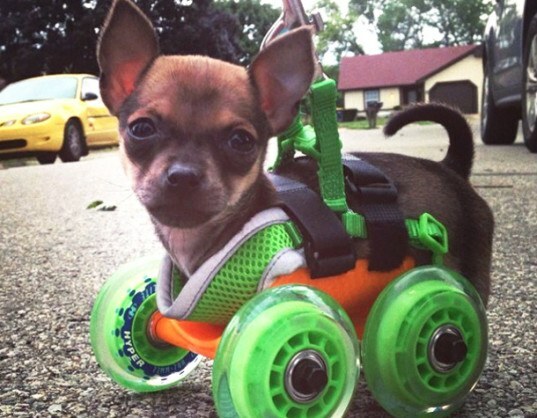 Born without front legs, the ridiculously adorable teeny tiny Chihuahua named TurboRoo has been given a second chance at mobility, thanks to 3D printing! Mark Deadrick of 3D design company 3dyn saw little Roo online, and used his 3D design mastery to create “new legs” for the sweet boy. The incredible wheeled cart, printed on a Makerbot 3D printer, has given TurboRoo independence, and a cool new way to scoot around the dog park. The path to TurboRoo getting mobility back all happened in one afternoon. 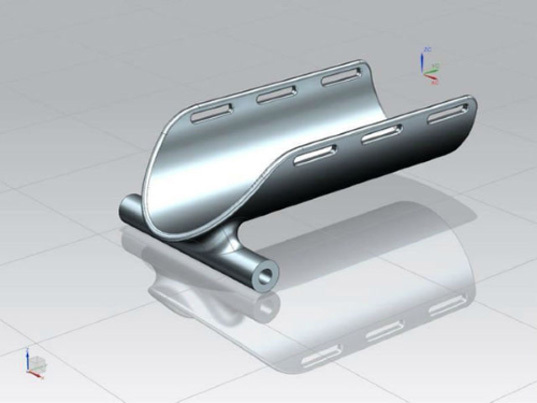 Deadrick designed TurboRoo’s new wheels using a 3D rendering program in just 20 minutes. Made up of just a curved sleeve that fits around the dog’s body, with a leveling bar for inline wheels, the cart was printed out on a Makerbot printer in just four hours. Once the cart was printed, Deadrick headed to a local sporting goods store to buy some inline skateboard wheels, which have the least resistance when TurboRoo was bouncing around. The cart was then fitted with comfy Velcro straps to fasten around Roo’s little body. A fundraiser for the pup raised $3,600, a whopping $3,000 over the initial goal. With TurboRoo’s newfound mobility, the pup has become fit, running faster and faster every week and making it up to one pound three ounces. With the excess money, TurboRoo will be not only be able to have new carts for when he outgrows his existing one, but other disabled dogs in the pound he was adopted from may also have another leash on life.